The recently finished holiday villa with private pool is fully furnished in modern luxury interiors with everything needed for a Samui getaway with your loved ones or friends. There are 2 levels of living area with the living room/kitchen and master bedroom on the lower level connecting to the terrace and pool deck and an additional 2 bedrooms on the upper level. All 3 bedrooms boast spectacular sea and mountain views as well as private bathrooms. The swimming pool has a water feature and color changing lights for a great atmosphere after dark. 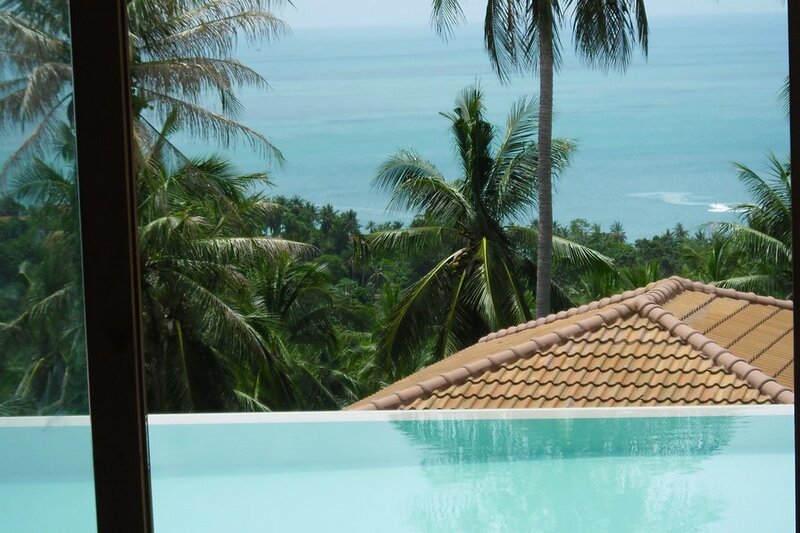 The large terrace around the pool has amazing views over Chaweng Bay and the surrounding mountains. Part of the terrace is roofed and equipped with an outdoor sofa which is great for relaxation by the pool without getting burned by the powerful Samui sun. The villa has an open plan kitchen thats fully equipped with a stove, an oven and a dish washer. All crockery, pots and pans are provided so cooking yourself is always an option. In case you prefer to sit back and enjoy good service we can also provide you with a private chef to cook and serve you.